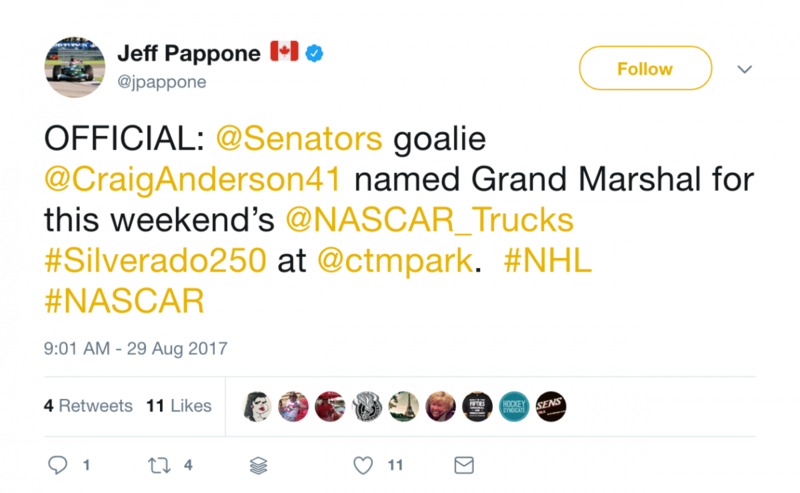 BOWMANVILLE, ON (August 29, 2017) – Ottawa Senators goaltender Craig Anderson will be the Grand Marshal for this weekend’s Chevrolet Silverado 250 at Canadian Tire Motorsport Park (CTMP). Canada’s biggest NASCAR event of the year runs Labour Day weekend September 1 – 3 and features the NASCAR Camping World Truck Series and the Canadian-based NASCAR Pinty’s Series.Anderson broke into the National Hockey League (NHL) with the Chicago Blackhawks in 2002-03 and has been with the Ottawa Senators since 2010. He has played in 506 games for four teams recording 238 wins. Anderson helped lead the unexpected and magical run the Senators had in the 2017 Stanley Cup playoffs with the team coming to within one win of securing a trip to the final for the first time in 10 years. Ultimately loosing to the Stanley Cup Champion Pittsburgh Penguins in the Eastern Conference Final, Anderson finished the post season with an impressive 11 wins, second only to Pekka Rinne of the Nashville Predators. Anderson won the NHL’s 2017 Masterton Trophy awarded to the player who exemplifies the qualities of perseverance, sportsmanship and dedication to hockey. Throughout the 2016-17 season, he posted a 25-11-4 record with a 2.28 goals-against average in 40 games while taking several leaves of absence to be with his wife, Nicholle, who was diagnosed with nasopharyngeal carcinoma, a rare form of throat cancer, in October 2016. In the off-season, Anderson is also an amateur race car driver and a big fan of auto racing, including NASCAR and the GTLM Corvette Racing team.